One of the most obvious spotting features of the original tooling for Bachmann's GP40 included an interesting rear headlight package as seen in the above images of the BN example. 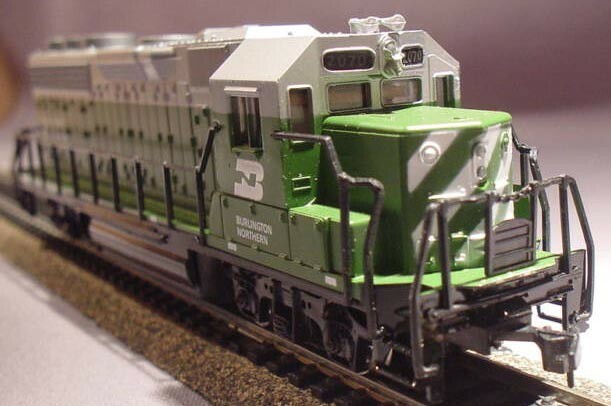 The third picture illustrates Bachmann's Burlington Northern GP40 featuring a silver roofline. Both examples, black and silver roof, feature the same BN lettering and 2070 roadnumber. Though not confirmed, I believe the silver roof examples of the BN GP40 arrives around 1980 in the Bachmann line. The first roadname added, according to Bachmann's annual catalogs, to the GP40 roster was the CP Rail model in 1971. 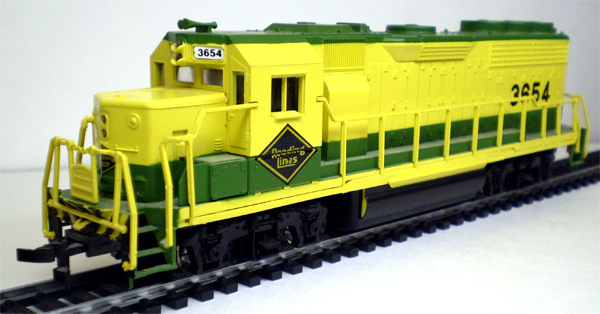 This green and yellow Reading GP40 makes no appearances in Bachmann's catalogs. It was produced for inclusion in a special release train set offering that provided a powered and non-powered pair of diesels. 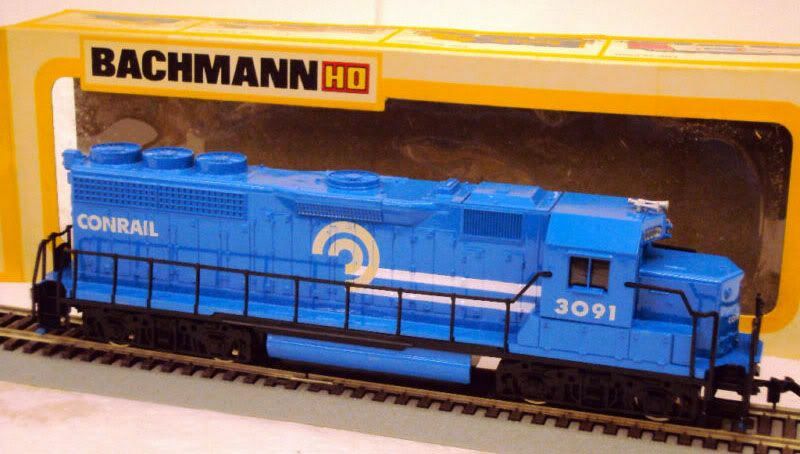 Though Bachmann's early '70s packaging featured a blue and yellow Santa Fe freight painted geep, the Santa Fe GP40 at this time was dressed in passenger red and silver warbonnet. 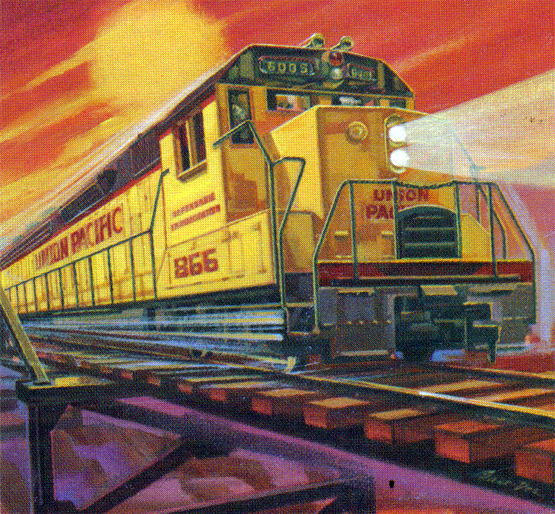 The above image is from Bachmann's 1976 product catalog and is representative of what this offered looked like during the '70s. Among the original six roadnames made available for Bachmann's GP40 was the Union Pacific example. The 1970 retail for a powered GP40 was $14.98; and a dummy GP40 sold for $6.98. The above image illustrates what this model looked like in the late '80s/early '90s. Notice the front pilot has been opened up to allow for a coupler mounted to truck set up. 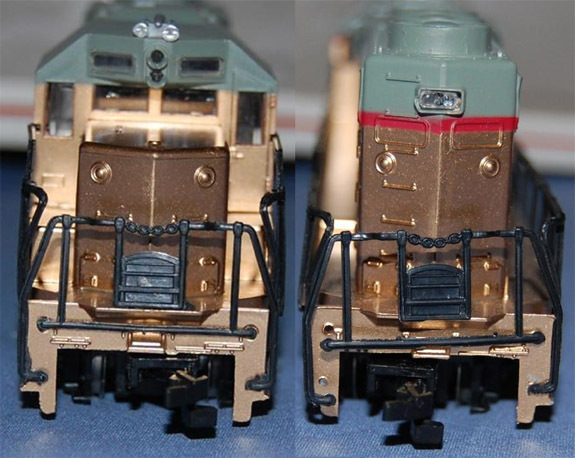 Bachmann on certain runs of the F9, U36B, and GP40 began using a Blomberg Dash-2 style truck sideframe. This Dash-2 frame is identified by the vertical shock absorber found on one axle face. 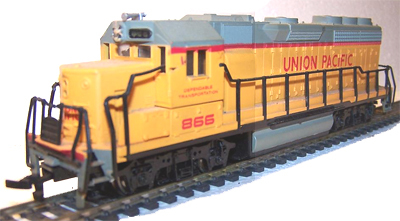 This Union Pacific GP40 is a variation to Bachmann's standard offering of the time with a shiny gold plated finish. 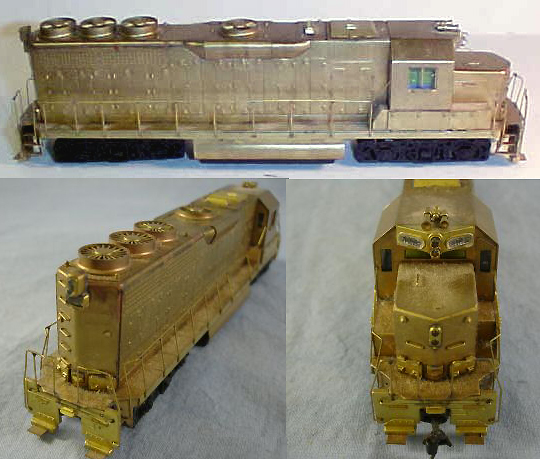 I don't believe the gold UP GP40 was offered as a separate item, but was always included as part of the company's Golden Spike train set offerings beginning in the 1980s. The images presented above show the nose and tail of the gold plated UP GP40. Notice the modification to Bachmann's original GP40 tooling. The first GP40 models Bachmann offered throughout the 1970s and into the '80s featured a headlight located in the nose of the unit, this is removed in this variation. The tail of the GP40 lost its vertical light that was mounted on the roofline of the original model. Finally, notice the front and rear pilots have been opened up to allow the swing of couplers mounted to the trucks. 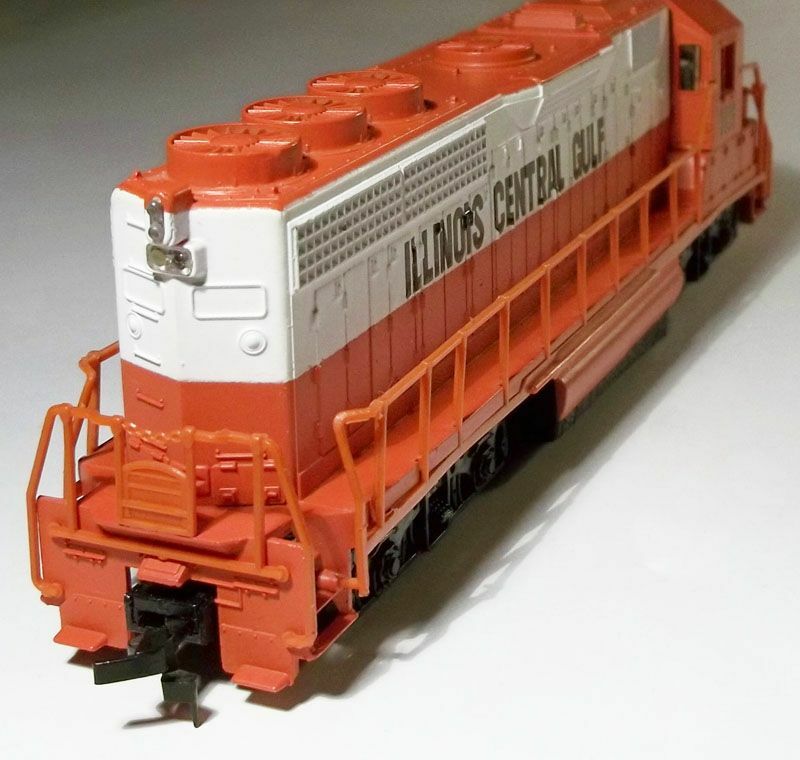 Above is the GP40 example Bachmann displayed at the 1971 Chicago Hobby Show. Note the original drive, which is found in Bachmann diesels through the mid 1970s. 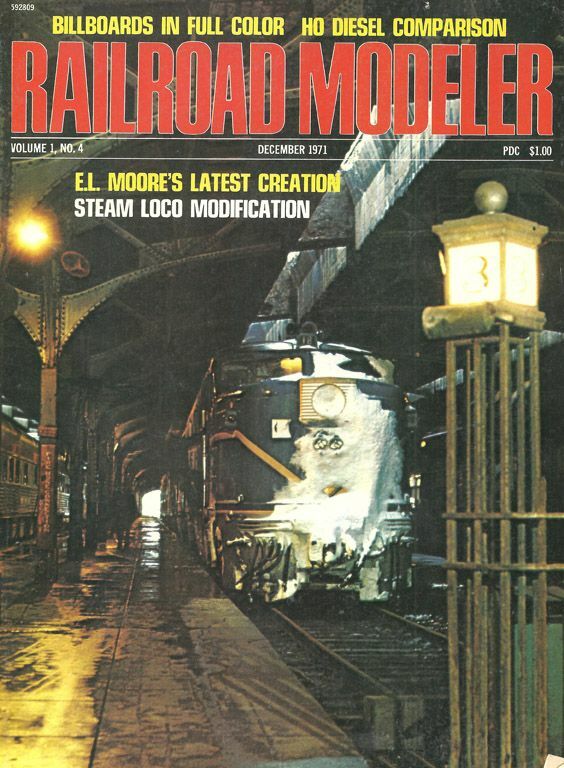 Model Railroader magazine reviewed the original Bachmann GP40 in the May 1971 edition of Trade Topics. Model Railroader mentions this release is part of Bachmann's, "broadening into HO scale." The review found the original drive offered a scale speed range between 9 and 130 mph. The 1971 release offered six roadnames: Burlington, Great Northern, Penn Central, Pennsylvania, Santa Fe, and Union Pacific. Notice the similarities in the tooling, when comparing the GEM and Bachmann? GEM also sold brass Metroliners, an F9-A and this GP40 that favored Bachmann's molds. GEM's F9 and GP40 diesels rode on Bachmann underframes. The GEM brass GP40 appears to arrive in the U.S. about a year after the introduction of Bachmann's plastic GP40. GEM's home was also in the same Philadelphia area as Bachmann's headquarters. GEM also offered a N-scale GP40 and F9-A that were similar to Bachmann's tooling. Bachman GP40s old and new presented above. The red and white Burlington 164 is an original early 1970s example of the Bachmann HO-scale GP40. 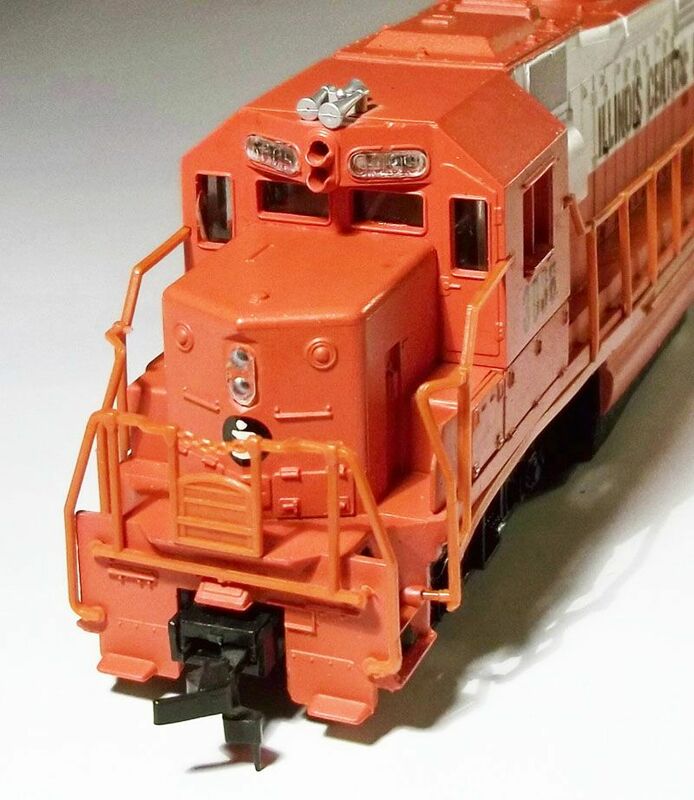 The wedge-scheme BNSF 3001 is 2011 Bachmann release GP40. The BNSF GP40 is from the Rail Chief train set offering. In the spring of 2014, Bachmann made revisions to its GP40 tooling again. 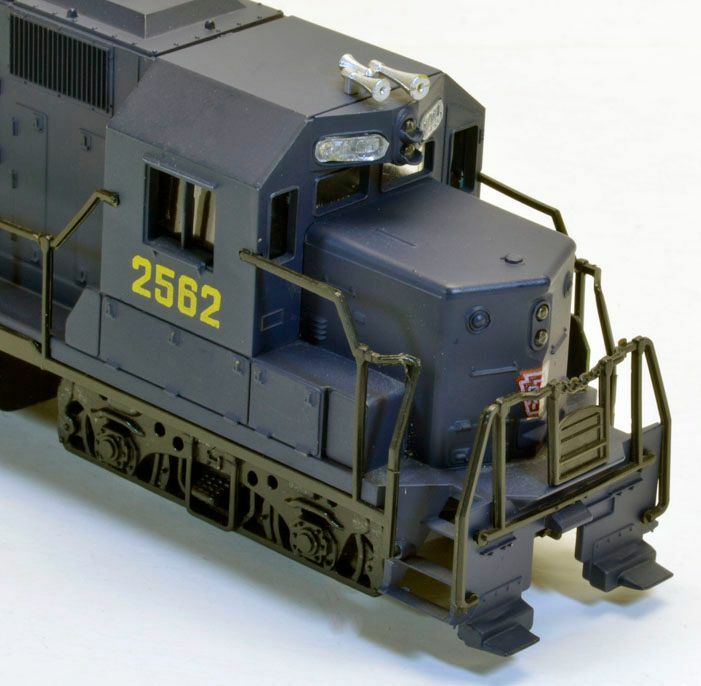 The June 2014 edition of Model Railroad News includes a review of Bachmann's Missouri-Kansas-Texas GP40 and details the revisions to the shell.